In a milder tone as compared to his earlier stand over fiscal discipline in the state, Punjab finance minister Manpreet Singh Badal said today that subsidies are important for the development of the state. The cotton growing Malwa region of Punjab, comprising the south-western districts of Bathinda, Muktsar, Faridkot and Mansa, which have reported a high incidence of cancer will soon have a specialised world class hospital for the treatment of the disease at Bathinda. The Central Jail, Bathinda, celebrated Punjab Day today as drug de-addiction day. All the inmates of the jail took oath to quit drugs. Several programmes, games, competitions, awareness plays, songs, poems and motivating lectures were organised by the authorities and the inmates to mark the occasion. The students of the local DAV College won the first prize in drama category by staging “Poster” written by Dr Shanker Shesh and directed by Prof Gaurav Vij in the four-day PU Diamond Jubilee Zonal Youth and Heritage Festival at Bhag Singh Hayer Khalsa College for Women, Kala Tibba, here last night. 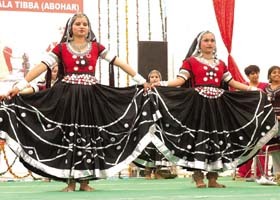 Picture perfect: Students compete in a dance contest at the festival in Abohar on Thursday. Punjabis have always been known for their innovative bent of mind. And the ‘Gharuka,’ or peter rehra, a four-wheeler, made by local mechanics, is its fine example. Though traffic rules do not allow this vehicle on the road, yet it keeps on plying. The ‘Gharuka’ is made by using a motor pump, used to draw water, as the vehicle’s engine. 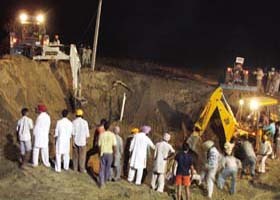 The Dyal Pura police has today registered a case of negligence against Nachattar Singh, the agriculturist, in whose field the sinking of bore well was being carried out by Manga Singh (25) of Hamir Garh, who died after a mudslide. Proving yet again that poverty is not a deterrent if there is the will to move ahead in life, three school-going children of a tender age have shown the way. Hailing from families with a humble background, these students of Sant Farid School, namely, Pradeep Kumar (class VI), Shubham (class IV) and his younger brother Vinay (class I) have resolved not only to continue their education but also to support their families. Delegates of the Punjab State Pharmacists Association met the health minister Laxmi Kanta Chawla at Chandigarh on Wednesday. The delegation was led by its president Ravinder Luthra and general secretary Gurinder Singh Sodhi, to discuss the long standing demands of the pharmacists. A three-week programme organised by the civil hospital here concluded on Wednesday. The programme was held under “Mission 2020: Vision for all” launched by the health department, Punjab. Muktsar police today arrested two women ‘travel agents’, Manjit Kaur and her daughter-in-law Sarbjeet Kaur, from Mohali, on the charges of duping a man on the pretext of sending him abroad, in the wee hours today. The Punjab police head constable Rajinder Singh of Gidderbaha was killed in a road mishap, while constable Kallu Singh of Model Town sustained injuries in a mishap which occured at Siviyaan road, late last night. The Gau Rakhya Sangarsh Committee held a meeting here today and members reached a consensus to demand revision in the electricity tariff for cowsheds (gaushala). Adesh College, Muktsar, won the basketball title in girls category on the second day of three-day Inter Polytechnic Games (boys and girls), at Government Polytechnic College, Bathinda. The second prize was won by L.L.R.M. College, Ajitwal (Moga) while G.N.I.T, Dallewal stood third. A three-day protest by the Chemist Association of Rampura Phul ended today. The protest got over after a meeting between SDM Rampura Phul, members of the association and a SAD (B) leader over the issue. Hakam Singh of Karar Wala village reported to the police that Nachattar Singh, Gurdev Kaur, Binder Singh and Satnam Singh attacked him with sharp-edged weapons and lathis on Wednesday. In a milder tone as compared to his earlier stand over fiscal discipline in the state, Punjab finance minister Manpreet Singh Badal said today that subsidies are important for the development of the state. He also said balance must be maintained between the subsidies given to weaker sections of society and development as a whole. The minister was here, along with Analjit Singh, chairman, Max Healthcare, to survey the site for the proposed cancer hospital. The minister also said that more revenue should be generated by creating infrastructure. “Almost 75 per cent of the people living in India have a daily income of Rs 20 and so if there are no subsidies, how will these people survive,” he said. The finance minister had earlier said that the subsidies given to various sections of society, including the farm sector, should be reviewed to improve the state’s fiscal health. The cotton growing Malwa region of Punjab, comprising the south-western districts of Bathinda, Muktsar, Faridkot and Mansa, which have reported a high incidence of cancer will soon have a specialised world class hospital for the treatment of the disease at Bathinda. This hospital will be set up by Max Healthcare in Bathinda with an investment of Rs 100 crore. Announcing this, Analjit Singh, chairman, Max Healthcare, said, “We have identified 3-4 sites in and around Bathinda. “We have already met the Chief Minister, Punjab, on September 13 and are looking at this project very seriously,’’ he added. The Central Jail, Bathinda, celebrated Punjab Day today as drug de-addiction day. All the inmates of the jail took oath to quit drugs. Several programmes, games, competitions, awareness plays, songs, poems and motivating lectures were organised by the authorities and the inmates to mark the occasion. The Bathinda Vikas Manch, a welfare society, presented a number of water warming equipment for the inmates, considering that winter chill is in the air. According to the jail superintendent, Bathinda Central Jail would be the first jail in the state having the facility of hot water for jail inmates. The officers of the jail organised an “Anti-drug awareness camp” to mark the day. The Deputy Inspector General of Police, Faridkot range, superintendent of the jail and the other senior officers of the jail delivered lectures to motivate the inmates to give up addiction to drugs, its consumption and sales. The whole premise of the jail was decorated with flowers and the boards conveying the message “Say no to drugs”. Quoting examples in the lecture given to the jail inmates, the DIG, Jatinder Jain, said, “The selling and consuming of drugs both ruin families.” He further shared some points of his research on the topic of de-addiction. The main event of the day was the play performed by the Attro and Group, a message to show the demerits of drugs. The frog race, tied feet race, tug of war and songs enthralled everyone. The DIG distributed prizes and honours among inmates who had performed well in the field of painting. Darshan Singh Grewal, deputy superintendent of jail, Manjeet Singh Sidhu, deputy superintendent, jail factory, were among the those present on thec occasion. Some of the jail inmates, who had painted the walls of the jail to convey messages to live a crime-free life, were also honoured on the stage. Inter-college folk dance and song competition associated with GNDU Amritsar marked Punjab Day celebrations at the Swami Keshwanand Mahila College, here today. Prof Gurdial Singh Dhillon, former head of the PG Punjabi department in the local DAV College and folk singer Tirlok Singh Brar were honoured for their contribution in uplifting the mother tongue and related literature as well as culture. Former SDM B. L. Sikka was the chief guest at the function conducted by the students independently. In the folk dance competition for boys, Jagdeep of SD College Faridkot and Pritpal Singh of Manav Mandir College Ferozepur bagged the first and second prize respectively, whereas in the girls category, Gurpreet Kaur of SD College Faridkot was declared the winner and Sonika of Vikas College for Arts the runner-up. Harpreet Singh topped among boys in the folk song competition. In the girls category, Sheenam of Vivekanand College Fazika and Maninder Kaur won the first and second prizes, respectively. People from all the neighbouring villages made a beeline to see the classical and giddha dances being performed by the students of local colleges. In the classical dance competition, there were only three entries, even when 13 colleges from the Muktsar zone were participating. Hina Parnami of Gopi Chand Arya Mahila College competed hard with Sheena of DAV College and Aruna Rani of the host college. The presence of famous folk singer Hakam Sufi also added flavour to the lively session. Ludhiana-based industrialist Rajneesh Ahuja, who was the chief guest on the occasion, complimented the principal Dr Parminder Sharma for organising the festival to promote extra-curricular activities. Drama: 1. DAV College Abohar 2. GN Girls College Muktsar 3. Govt. College Muktsar; Individual prizes: 1. Sarbjeet Kaur Dashmesh Girls College Badal 2.Kirandeep Kaur Maharaja Ranjit Singh College Malout 3. Baljinder Kaur DAV Abohar. Histrionics: 1. Manvinder Kaur Bhag Singh College for Women Kala Tibba 2. Neeraj Sachdeva DAV Abohar 3. Priyanka, Gopi Chand Arya Mahila College Abohar. Skit: 1. GN Girls College Muktsar 2. DAV College Abohar 3. Maharaja Ranjit Singh College Malout. Individual prizes: 1. Vishal Bishnoi DAV Abohar 2. Ramanjot Singh MRSC Malout 3. Reema, GAMC Abohar. Quiz: 1. DAV College Abohar 2. Bhag Singh College for Women 3. Guru Nanak College Killianwali. Essay writing: 1. Gopi Chand Arya Mahila College 2. Dashmesh Girls College 3. Bhag Singh College for Women. Poem Writing: 1. DAVC Abohar 2. Govt College Muktsar 3. MRS College Malout. Short story writing: 1.Bhag Singh College for Women 2. Govt. College Muktsar 3. DAV College Abohar. Punjabis have always been known for their innovative bent of mind. 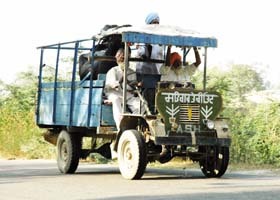 And the ‘Gharuka,’ or peter rehra, a four-wheeler, made by local mechanics, is its fine example. Though traffic rules do not allow this vehicle on the road, yet it keeps on plying. The ‘Gharuka’ is made by using a motor pump, used to draw water, as the vehicle’s engine. Then, a steering, wooden plank and tyres are assembled to give it a final shape in the form of a four-wheeler to carry passengers and goods. Though this vehicle is not entitled for registration under the Motor Vehicles Act, yet it is very popular in both urban and rural areas of the Malwa region due to the alleged lack of transport facilities. “The government should increase the frequency of buses to all the villages. Only then will the ban on peter rehra succeed,” he added. “The government may be right in imposing a ban on plying the vehicle on the main roads. But this vehicle is being used for carrying agricultural products from the fields. So, in the rural areas, there should be no restriction on it,” said Sukhjit Singh, owner of a Gharuka, in village Sangat. Manga was buried while installing a motor pump in the deep hole in the village on Wednesday. The rescue team pulled out Manga Singh, who later succumbed to injuries in the Rqampura Civil hospital. In another incident of land caving in, Parma Singh of village Dyal Pura Bhai Ka, who was digging and cementing the bore well on the same day. The land got caved in and he got buried in the deep pit. Even after continuous attempts, he could not be pulled out till late on Thursday evening. JCB machines and tractors were seen doing the job late in the Thursday evening. The SDM, Rampura Phul, Uma Shankar said, “Efforts to rescue the person is going on.” A case under Section 188 of IPC has been registered against the landowner, Joginder Singh of village Dyal Pura on Wednesday. Police sources said that the district magistrate, in an order regarding digging of wells and tube-wells, had made getting permission for the same mandatory. As per the order, presence of some administrative official is required. Proving yet again that poverty is not a deterrent if there is the will to move ahead in life, three school-going children of a tender age have shown the way. Hailing from families with a humble background, these students of Sant Farid School, namely, Pradeep Kumar (class VI), Shubham (class IV) and his younger brother Vinay (class I) have resolved not only to continue their education but also to support their families. While the other children of their age do not even know what struggle really means, these children experience it every day. 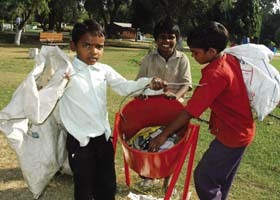 They do not rush to play after they come back from school but instead, go to unhygienic places to pick rags. They search the garbage for small pieces of plastic, glass and other abandoned durables to sell them in the market for a mere pittance. The remuneration that these kids get after labouring for hours may deter others but it certainly infuses a sense of confidence and pride in them. “We pay for our education with the money earned and support our family too,” said Shubham. 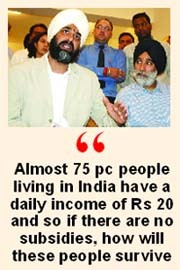 “On an average, we earn about Rs 25 a day. But it is hard-earned money. After school hours, we collect the garbage and sell it. We study at night,” says Pradeep. These children, who reside in Bank Colony, may get treated with contempt, but are still blazing their own trail. Delegates of the Punjab State Pharmacists Association met the health minister Laxmi Kanta Chawla at Chandigarh on Wednesday. The delegation was led by its president Ravinder Luthra and general secretary Gurinder Singh Sodhi, to discuss the long standing demands of the pharmacists. During the meeting, minister assured that more money would be allocated for the purchase of medicines. She also said that it would be ensured that the purchased medicines would be of standard quality. It was decided that instead of providing medicines to all districts of the state by four existing zones, the medicines would be supplied at the district headquarters for further distribution. A chief pharmacist would be included in the drug demand committee at the district level, she added. The minister also assured to initiate a refresher course for all working pharmacists and would consider a grant of risk allowance in view of the serious nature of their duty. Ferozepur unit president Shashi Kant said the minister had assured to look into other demands related to change of designation of pharmacists to pharmacy officer, grant of gazzetted status to chief pharmacist grade–1and prescription rights to chemists in the absence of medical officer. The health minister reiterated that the increase of their pay-scales would be referred to the finance department and the newly set up pay- commission. S. P. Garg, senior medical officer (SMO), civil hospital, Fazilka informed that the eyesight of 300 children, below 14 years and from different slum schools of the town, were checked at the programme that started on October 11. He said those with a weak eyesight would be provided free spectacles by the District Blindness Control Society, Ferozepur. Garg, an eye surgeon, urged people to come forward to donate their eyes so that after their death, they can be used by patients with eye problems. It would also help in eliminating blindness. Those who have lost vision because of damaged cornea would benefit from their noble act as replacing their cornea would restore their vision. He also lauded the efforts of the NGO, Social Welfare Society, Fazilka, which undertook the eye donation project. The SMO advised children to take adequate quantity of Vitamin A, eat green vegetables and watch television from a distance of at least 10 feet and that too with tubelight on so as to prevent loss of vision. He also advised children to avoid eating junk food. They were later brought to the city police station and would be produced in the court here tomorrow. The police had registered a case against the two women under section 420 of the IPC last Friday on a complaint filed by one Chamkaur Singh of Kotli Abloo village in Muktsar district. The complainant had stated that the two accused, residents of sector 46 in Chandigarh, had taken Rs 4 lakh from him on the pretext of sending him abroad. The Muktsar police team, led by sub-inspector Jarnail Singh, raided the premises of the accused in Mohali at 4 am and arrested them, SHO Baldev Singh told ‘The Tribune’ here. According to the relatives of the two women, Sarbjit Kaur is legally divorced but was living with her mother-in-law in sector 46, Chandigarh, since 2002. Police sources said both the motorcyclists were on their way to the city after completing their duty. Both were deputed at the thermal police station. After receiving the information, an ambulance of Sahara Jan Seva took them to the civil hospital. Rajinder was declared brought dead. Sensing the critical condition of Kallu Singh, doctors referred him to a private hospital. Getting information about the accident, ASP Harsh Kumar Bansal and senior police officers reached the civil hospital. A case has been registered against the unidentified driver of the tractor-trolley. The meeting was presided over by Sushil Babar. A unanimous resolution was passed to demand the revised electricity tariff at the rate of Rs 2 per unit on the pattern similar to that of Haryana. Talking to mediapersons, Sushil said they had received a copy of the official letter issued by Uttar Haryana Bijli Vitran Nigam. In the letter, the Haryana government, vide its circular no U-69/2007, had decided to revise the electricity tariff for a registered cowshed at the rate of 200 paisa per unit from June 1, 2007, he added. He said Gau rakhya was a sensitive issue related to Hindus. The upkeep of stray cows was also discussed. In these games, teams from all polytechnic colleges from Punjab and Chandigarh are participating. In girls, kho-kho match, Government College, Ludhiana defeated Government College, Ropar. In another match, Polytechnic College, Ajitwal girls team defeated Government College, Patiala. Finals of kho-kho were won by L.L.R.M. College, Ajitwal while Government College, Ludhiana, stood second. The third position was won by Government College, Patiala. Jagroop Kaur of Moga, Jasdeep Kaur of Ludhiana and Kuldeep Kaur of Patiala were declared best players in kho-kho. Balkar Singh Sandhu, principal, Government Polytechnic College, Bathinda and president, Punjab Polytechnic Institution Sports, urged all the players participating in these games to take part in all extra-curricular activities as well. Sources said it had been decided that at the time of the raid, a member of the health department would be present along with a drug inspection team and the police would not interfere unless there was trouble.